I ran through a little bit of the story of DOMS back in my Groove Slim Triangle review, so I won't bore you with it here. This DOMS Neon is one of the few round and eraser-tipped Indian pencils I've used, and while I like it, it does have a few shortcomings. Neon colors are not really my thing. I like my retro colors to be more 70's (the browns! the mustards!) and I like my fonts to be a little more in the classic san-serif style. So with the color and imprint, this DOMS Neon is 0-for-2 just starting out. I know my tastes aren't like everyone's: Deirdre over at The Weekly Pencil has a neon pencil obsession that borders on fetish, and I think she would like these. In this box of 10, you get a short point sharpener and 2 of each color, all neon versions: blue, pink, yellow, green, and orange. I chose to test out the orange because it was the least offensive, though the blue isn't that bad either and could border on a nice Cerulean blue Crayola color. The imprint is black and everything printed is on the same side. UPC down towards the end, then the name and grading as you get closer to the ferrule, which is also black. The erasers match the color of the lacquer, but as you'll learn later, it will soon match the color of the ferrule. The ferrule attachment isn't that great, and most of my 10 were a little lopsided, once even pushing the paint down a little. According to the box, the Neon features "softened and well-treated wood for smooth sharpening and longer shelf life." Shelf life of what, I wonder? The sharpener blade? The pencil itself? Regardless, it does well in my two favorite sharpeners, the CP-80 and the Pollux. And the best shavings-flower maker in the world, the KUM Masterpiece, cut through it easily, even with a slightly used blade. 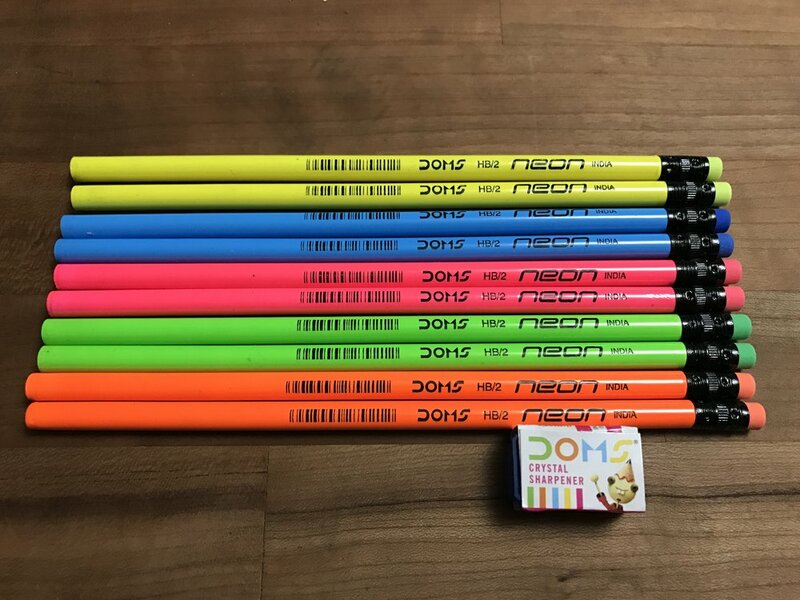 Like many Indian pencils, the DOMS Neon has a great dark core. It sits a bit darker than the DOMS Groove Slim and just about as dark as the DOMS X-1 Super Dark. I wish I had a better way of judging graphite than my own handwriting, but that's how 95% of the pencils I review will be used, so until someone creates a desk-sized machine for grading pencils, I'm going to stick with that. (Though if you know of something, hit me up!) I used the same paper I've used for all my testing, the Write Notepads Steno, which I think sits in the sweet spot between toothy and smooth. If I tested everything in a toothy Baron Fig Vanguard, it'd seem darker than normal, and vice versa in something super smooth made for fountain pens. 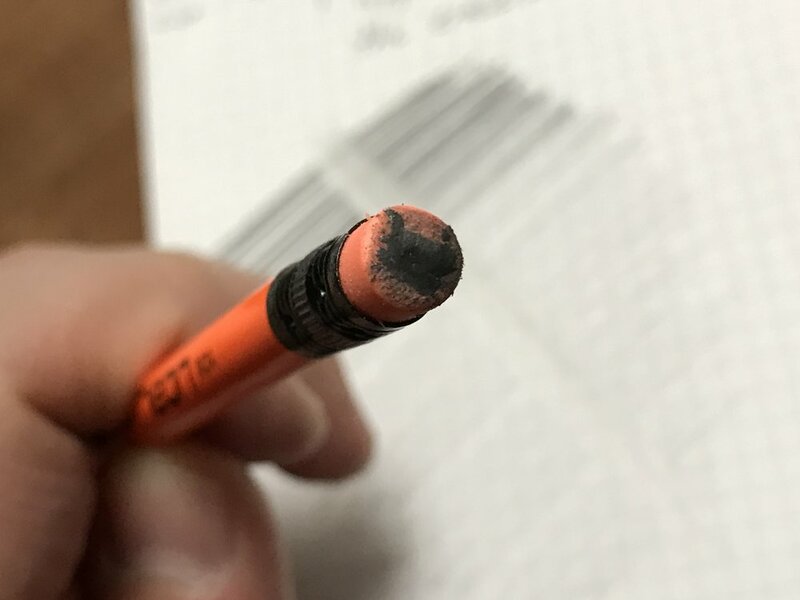 The cores on all 10 pencils looked centered to the naked eye and my orange tester sharpened center the way through. Point retention was good on the Steno, and so-so on the Infinity Vanguard. I would say this is not true to grade, maybe a little softer than HB, verging into B territory. Starting to match the ferrule. Gonna have to call it like I see it here: the eraser is utter crap. What gets me is that all these Indian pencils I've been getting lately come with an eraser in the box, and they are GREAT, but anything attached is junk. They clearly know how to make an eraser, but apparently DOMS can't translate that into these Neon eraser. They are hard, gritty, and don't do much other than collect the graphite on the end of the eraser, turning it black. These are not old pencils, either: the box says they were packaged in December of 2016. Maybe it has something to do with the color they have to add to get it to match the neon lacquer, maybe not. All I know is I haven't seen an eraser this bad on an otherwise decent pencil since the Golden Bear. Usually, if I put it under the light and can see some reflective grains in the eraser, I'm a little wary until it proves itself. This is no different. As I mentioned above, a lot of the ferrules in my pack were lopsided, however, they are deeply crimped into the wood and feel super solid. I don't use many round pencils, as it seems like most of the round pencils around these days are either promotional pencils (Field Notes, Story Supply, countless Musgrave theme-wrapped pencils) or Jumbo pencils. I used to use the Field Notes pencil quite a bit, but this is a completely different experience, because the lacquer is so smooth on the Neons, to the point of slick. My hands kept searching for an edge while writing, but my ring finger, where my pencil rests, was happy there wasn't one. The eraser / ferrule combo does make the pencil a little more top heavy, like American pencils. Ultimately, the wood feels light, and the pencil as a whole feels lighter than its Indian counterpart, the Casemates Neon. I like the round shape, wood, and core of this pencil, but not much else. Some of the things I like are subjective, like the colors, but the ferrule and eraser situation is terrible no matter how you look at it. I'd like to say I got a bad batch and the ferrules shouldn't be that badly affixed to the pencil, but this is the only batch I've gotten, so I can't know that for sure. The eraser is total junk and does nothing but smear the graphite everywhere. For me, this is going to be a desk pencil that I rarely pick up; I can't take it anywhere because I generally refuse to carry a separate eraser with me unless there are special circumstances. If you like neon pencils and can deal with the crap eraser, this pencil is not bad, the core is excellent, and they are cheap enough to be worth a shot.